Reliance Youth Foundation installs India’s first Astroturf full size artificial football field at the Reliance Corporate Park in Ghansoli, Navi Mumbai. Headed by Mukesh Ambani, Reliance Industries Limited (RIL) is an Indian conglomerate holding company headquartered in Mumbai, Maharashtra, India and owns businesses across India engaged in energy, petrochemicals, textiles, natural resources, retail, and telecommunications. Being the third most profitable company in India, the second-largest publicly traded company in India by market capitalization and the second largest company in India as measured by revenue after the government-controlled Indian Oil Corporation, the company is ranked 215th on the Fortune Global 500 list of the world’s biggest corporations as of 2016. It is ranked 8th among the Top 250 Global Energy Companies by Platts as of 2016. 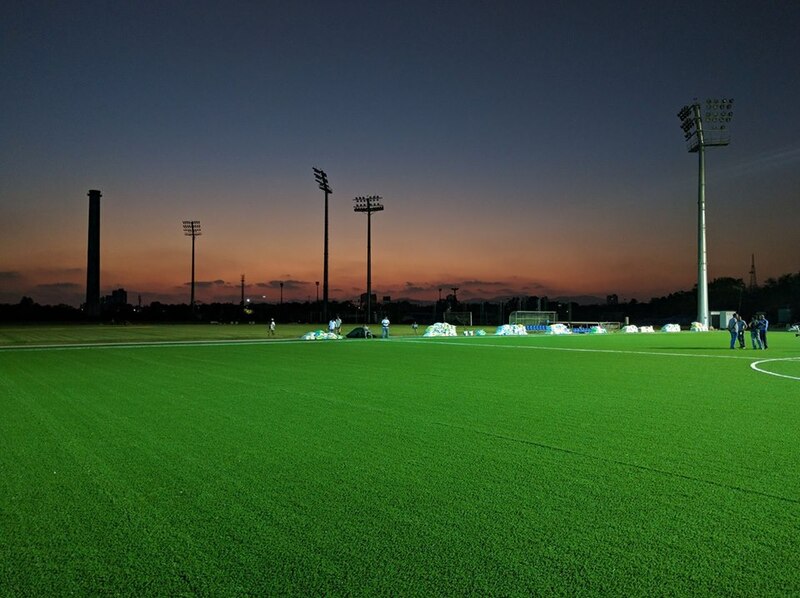 Reliance’s investment in sports facility includes one full size Cricket pitch, Football field and the recently installed artificial field by Astroturf. With a vision to provide a world class platform Reliance Foundation built the state of the art sports facilities at the Reliance Corporate Park a facility spread over 500 acres in Navi Mumbai. Leaving no stone unturned Reliance Foundation opted for the best in the business American artificial turf company AstroTurf as their preferred choice for their artificial football field. Astroturf had its best turf management experts and engineers coming down from the U.S to lay the turf. Chip Moreland CEO and managing partner of Fraser Edwards brought his vast experience of 25 years in the industry along with Chris Steiner who is National Director of turf installations for Sports Construction Management (SCM) who overlooked the entire project at Reliance Corporate Park. Jose Angel Marshal led his team of engineers under Chris who are specialists in both AstroTurf Root zone systems and Brock. The 88,000 sq.ft of turf was laid down with precision and strategy thought out by Chris and his team. The sports facilities at RCP will mainly be used by Reliance Foundation for their youth program called Young Champs, an initiative launched by Reliance Foundation to spot top footballing talent in the country between the age group of 11 to 14 years through the Indian Super League’s grassroots initiatives and give them the necessary impetus to enhance and hone their skills. The Young Champs program is primarily geared towards elite player development to firmly secure India’s footballing future through structured technical guidance. Every year, Reliance Foundation will be funding the Young Champs program by providing the most talented boys and girls coming through the Clubs’ grassroots activities as well as select NGOs (Magic Bus, Yuwa and Slum Soccer), full-time residential scholarships. The scholarships are aimed at not only developing their footballing abilities but also enhancing their academic acumen, thus providing children a well-rounded sporting as well as educational environment to thrive in. The likes of Gouramangi Singh (Former Indian Football Team Captain) also made a special visit to the facility to check out the newly installed turf. Leaving no stone unturned Reliance Foundation opted for the best in the business American artificial turf company AstroTurf as their preferred choice for their artificial football field. 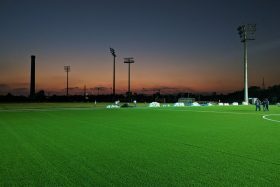 The field includes 88,000 square feet of the FIFA approved Astroturf 3DX 60 turf system, a premium product which incorporates two different specialized fibers with the secondary fiber being a 5000 denier Polylon Root zone which the latest technology to be used in the industry which prevents injury by reducing “foot fix” and also minimizes infill splash. After opting for additional Brock pads which act as shock absorbers under the turf Reliance have probably set up the finest artificial turf there is in the country.